« New Year, New Moon, New…Moonstone? Hello, my little winter chickadees! Well, the holiday season is over, and we now have the long stretch of winter to face. Everybody has turned their Christmas lights off, it’s dark, it’s cold, and we don’t have any statutory holidays until Easter. The only bright spot for me is that my birthday is this month. And while I am on the far side of my 30’s, I still get excited about my birthday. Mind you, that’s probably just because I love attention. 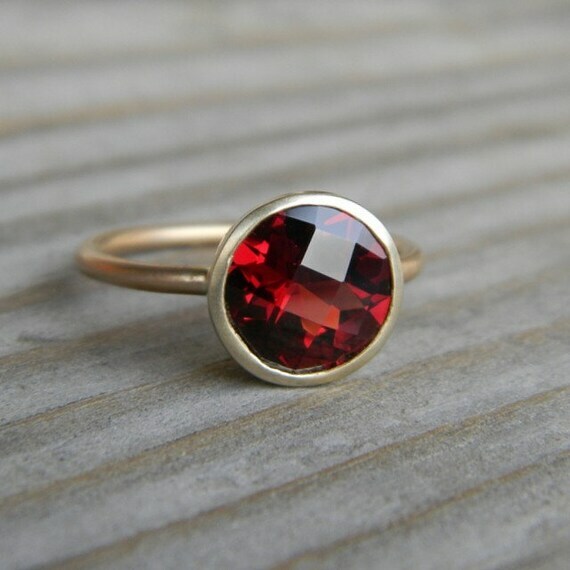 I also love garnets, January’s birthstone. I’m a bit weird about garnets, though — I’m not a fan of them when paired with diamonds. However (confession time), as a general rule, I don’t like it when diamonds are used to accent precious or semi-precious gems. I prefer for the gemstone to take centre stage, or for it to be paired with something interesting or unusual. Pairing a garnet (or a sapphire, or an emerald, or a pearl) with little accent diamonds just seems kind of, “Ooh, let’s jazz this up a bit by adding a bunch of little diamonds!” I guess it just seems sort of lazy. Mind you, I’m sure there IS some fantastic jewelry out there that pairs gemstones with diamond accents — it just seems to be the exception rather than the rule. I told you I’m weird. Garnets species are found in many colors including red, orange, yellow, green, blue, purple, brown, black, pink and colorless. Of course, red (rhodolite) garnet is the one that we see most often. The word “garnet” comes from the Latin word “granatus,” meaning “grain” or “seed.” This name was given to the garnet because of its close resemblance to the pomegranate seed. A gift of garnet is thought to be symbolic of love and the desire for a loved one’s safe travel and speedy homecoming. As well, garnets were once used medicinally, to increase strength and ward off several medical problems including blood disorders, heart palpitations and lung disease. The irony is that this garnet jewelry would CAUSE heart palpitations, thank you very much. Yes, this is a baby’s pendant, but I see no reason why I couldn’t have it set in a longer chain for myself. It’s just too adorable! We also have this simple, but perfect ring. 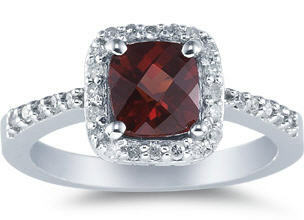 The setting doesn’t distract from the gorgeous, deep, rich red of the garnet. Delicate, but still very, very striking. Me likey. So, happy birthday to all my fellow January babies! May your birthday bring you some pretty new garnet baubles! This entry was posted on Thursday, January 6th, 2011 at 11:13 pm by La Petite Acadienne and is filed under Alexis Bittar, Birthstones, Earrings, Gems, Gold, Necklaces, Rings. You can follow any responses to this entry through the RSS 2.0 feed. Both comments and pings are currently closed. Though not a January baby myself, I can appreciate the warmth and approachability of garnets, so much more accessible than cooler, pricier rubies. And while the diamond framework on a smaller stone definitely has that mass-produced look you find in the jewelry departments of low-end department stores, I find that, for some reason, the diamonds flanking Kate Middleton’s 18-carat sapphire do not hurt it one little bit. That last ring made me gasp a little. One of my favorite pieces of jewelry I bought for myself was a silver and garnet ring I bought in Russia. Interestingly, in Russian, the word for garnet is the same as the word for pomegranate – “granat.” I saw it in a window, but didn’t have time to go in and try it on. It haunted me, and when I went back a couple days later, it fit perfectly, which pretty much never happens since I have tiny hands and fingers. We were meant for each other!